Family-owned company founded in 1953 by Mr. W.S.H. Osborne as Stuart Heywood Engineering Ltd to produce components for vehicle manufacturers. In 1957 we were the first company in the UK to make special timing pulleys. Changed name circa 1965 to Transmission Developments Company to reflect the growing importance of timing belts and pulleys to the company. Introduction of SYNCHROFLEX Timing Belts from ContiTech to the UK. Further growth resulted in a move to Hamworthy Industrial Estate in Poole, to take advantage of 3000 sq ft of floor space. Control of Transmission Developments passes to Mrs J Osborne. Her vision drives new investment, an expansion of products and services and a restructuring of the company. In a natural move to complement its belting products TransDev opens a Chain division. The continuing investment by Mrs Osborne sees new chain brands such as Wippermann, TYC and Witra sitting alongside the leading belting brands TransDev has already become known for. As part of the major expansion of TransDev, started by Mrs Osborne, a Plastics Division is formed (Transplas). This new Division will manufacture plastic wear strips and guide-rails for belts and chain as well as stock a wide range of semi-finished display and engineering plastics. Control passes to second Osborne family generation, Ian and Carole Osborne. They utilise their experience gained in the wider industry and at TransDev to continue to build on the legacy of their mother Mrs Osborne. Further investment in warehouse to support growth including Kardex storage and retrieval systems. Celebrating over 50 years of history, TransDev looks to the future with a refreshed brand and further major investment in infrastructure and people. Linear solutions from NTN SNR and IKO are introduced to further enhance the TransDev product offering. This includes investment in a state of the art linear rail cutting machine for fast deliveries. Today, TransDev has four major business activity areas with nearly 100 employees in over 70,000 square feet of production and warehousing space. Transmission Developments started life over fifty years ago as a specialist manufacturer of timing pulleys. Since then we have always aimed to set the highest of standards in power transmission. In the early days the company’s founder, Mr. Stuart Osborne, introduced the, then all new, polyurethane metric pitch “Synchroflex® Timing Belt” to a British industry that still worked in imperial measurements! The complete drive concept was the foundation of a company that has grown into the largest independent, family owned, manufacturer and supplier of transmission belting and related products in the UK. Continuing the work of Mr Stuart Osborne, Mrs J Osborne drove new investment and oversaw a restructuring of the company. Her vision enabled new product areas, such as plastics and chain and the development of the warehouse as a major distribution hub. Today, thanks to the determination of our founders and a solid financial base, we remain focused on quality, service and our thousands of global customers. Power Transmission, Conveying and Plastics Solutions since 1965. 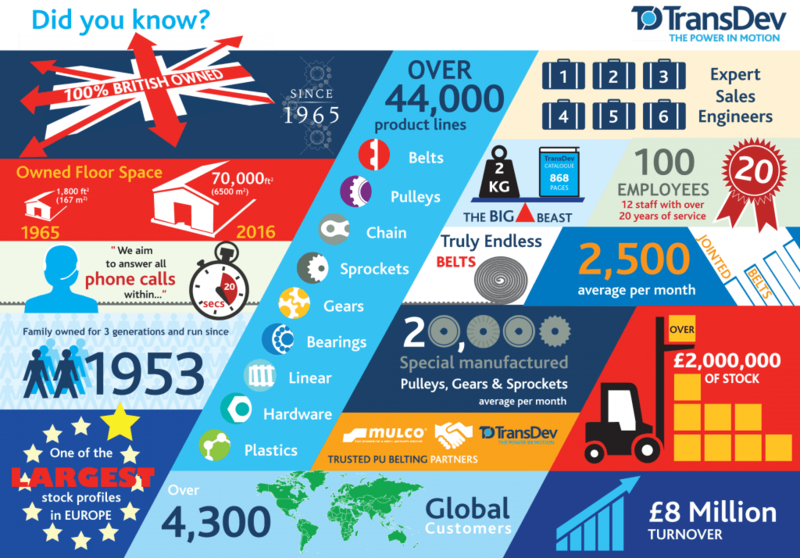 Founded over 50 years ago, TransDev are major manufacturers and stockists of major timing and conveyor belt and chain brands; with in-house customisation available. We are the UK’s largest manufacturer of Pulleys, Gears and Sprockets. Large gear, pulley and sprocket stocks for rapid rework and made-to-order are a speciality. We are also a ‘one stop shop’ for Plastic materials, machining, routing and injection moulding. 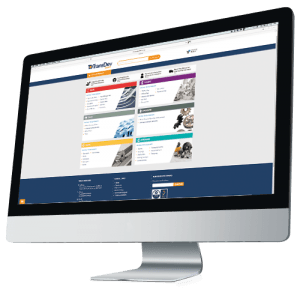 Apart from developing the largest range of standard/special transmission, indexing and positioning belting products, Transmission Developments has successfully incorporated an extensive range of gears, chains and plastics products, most of which can be found in this catalogue.